METAL FORMING, SPRINGS & SHEET METAL FABRICATION SOLUTIONS. Problem Solving: Excellent in house engineering department becomes involved at the beginning of every project to verify the integrity of the product design & material used to ensure a quality product at the BEST possible price. Prototyping: All prototyping and short runs can be done within 2 weeks. Tooling: Lead time for production from 3 – 5 weeks. Specializes in tooling for high volume production runs. AS9100 is the quality management standard specifically written for the Aerospace Industry (Aviation, Space and defense). 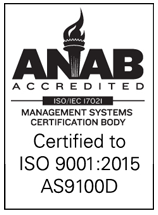 The current version of AS9100C aligns the standard with ISO9001:2008 and has extra requirements regarding Regulatory Compliance and aerospace-sector specific requirements. As a result, ISO9001:2008 is totally encompassed within AS9100C with additional requirements specifically addressing aviation safety concerns. ITAR Registered: BHI Solutions is now an ITAR (International Traffic in Arms Regulations) registered facility. This designation certifies that BHI Solutions has in place the necessary procedures to comply with the provisions of the Arms Export Control Act (AECE) and gives BHI Solutions the authorization to manufacture and ship Military and Defense parts. BHI Solutions aims to deliver a level of service that exceeds the expectations of its customers.